The Rebel Sweetheart. : Spotlight | Bifesta Sebum Cleansing Lotion. I can't believe that the last time I featured a makeup remover in my blog was January of last year. That means I have stuck to one brand of makeup remover for the longest time without even realizing it! But thanks to one of my mommy friends at school (who's just as addicted to makeup as I am), I was able to break the monotony and try a new brand of makeup remover. She gave me this bottle of Bifesta Cleansing Lotion, which I have been using for a little over a month now. This water-based makeup remover is available in four variants - Bright-up (for dull and flaky skin), Moist (for dry and sensitive skin), Age Care (for mature skin), and Sebum (for combination skin). It comes in a sturdy and reusable plastic bottle, and is available in one size only (300 mL). Now if you're the kind of person who hates going through the long, elaborate, and oftentimes tiresome process of removing makeup, washing your face, toning, moisturizing, etcetera, etcetera - then this product is just for you! Comes in a 300 mL bottle. Now here's my cotton pad doused with two pumps of Bifesta Cleansing Lotion. The liquid is actually clear, and it's mildly-scented, too. It's gentle on the skin and doesn't sting the eyes, which is a plus for me. Two pumps of the Cleansing Express! It does a good job of cleansing the skin and removing non-waterproof/regular makeup like BB Cream, powder, eyebrow pencil, eyeshadow, and blush. However, this product doesn't work too efficiently with waterproof eyeliner and mascaras - especially mascaras. Well, this product is water-based, after all, so I really can't complain. All that gunk off my face! If you wear light and washable makeup, this product is right up your alley. But if you wear heavy makeup on a daily basis, this product may not be the most economical choice as you'll need more than just three pumps to get all that gunk off your face. Overall, I love how this product is affordable and easily available, and how it removes makeup without irritating the skin. I also like the fact that it contains green tea extract, which rejuvenates the skin, and hyaluronic acid which brightens and smoothens the skin. 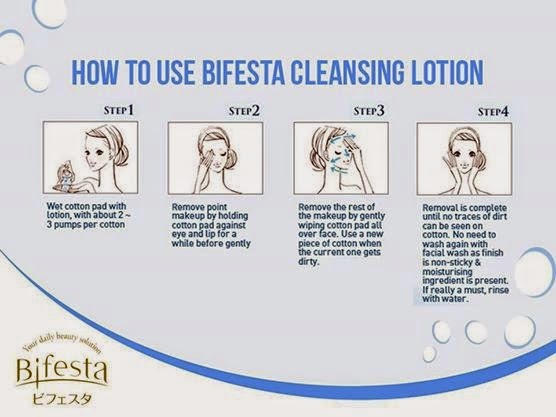 The Bifesta Sebum Cleansing Lotion sells for Php 419 per bottle and is available at Watson's and other leading drugstores. sounds like it gets the job done! I love that it has only a light fragrance and is non-stinging. Those a big bonuses for a makeup remover for me. I have been using Mary Kay makeup remover forever...and love it. This does look like a good product though...I like that it cleanses too! I need to get something like this for my daughter. She normally uses soap and water to remove her make-up. I like that they offer different blends for various skin types. I badly need this! Nauubos ko kasi wipes ng mga bagets ko pagtanggal ng makeup lalo na sa eye area haha! Looks like this works great! I rarely wear makeup and when I do I wear it very lightly so this would work great for me. It looks like it is a gentle product which is also a plus! I am always looking for a good makeup remover! It looks like it did a great job. I'm definitely one of those people who doesn't like a long routine. This sounds like something I should try. Waaah sayang it doesn't do well with waterproof mascara. I bought Moist recently but haven't tried it yet. Been looking for a more economical alternative to Shu Uemura Cleansing Oil.